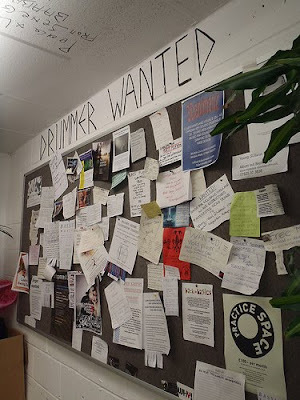 The 'Drummer Wanted' board at Rough Trade East is a place where East London's musical hipsters come together to scrawl notes about how they need other hipsters to make their dream work, by playing in their band. London is presumably where hip young things come to try to make it in the music business, and whilst they're not posing in record shops and riding fixed-wheeled bikes, they actually have to do some practice, and find other musicians to play with, so Rough Trade helps them so it all with bike storage, a huge record shop and a noticeboard. Rough Trade East is on Dray Walk and is open lateish every night. For more on the shop and its opening hours, click here.